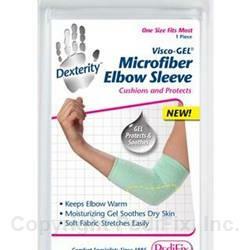 Microfiber Elbow Sleeves provide deep hydration to the elbow area. The proprietary gel lining releases a combination of skin nourishing hydrators which help soften and improve the elbow’s appearance. Conditions dry cracked elbows. Helps prevent hard skin & calluses. Cushions on contact. Sleeves can be easily applied or removed. Washable and reusable. 1 per pack. Comforts, soothes and nourishes with moisturizing gel. Pull on gently over elbow. Store in a cool place when not in use. Do not place product on an open wound. If irritation, discomfort or poor circulation occurs, discontinue use and notify your physician. Remove from skin 3 to 4 hours daily.